No one involved ever expected it to endure - let alone be acclaimed -but as it occurred this month, I still get a call about it every year or so over the more than three decades since our little campaign launched. When concepted in 1980 and launched in 1981, the campaign was intended to last only a few years at best. Those were the days before testing was feasible and we were just glad it worked. It remains the only campaign by a community destination marketing organization (DMO) to win a full-blown CLIO award in the overall travel category. Clio is the preeminent international award competition for the creative business. The campaign, originally designed to run only as a public service announcement when there were only three TV stations was also recognized as one of the hundred best TV commercial that year. Advertising Age, a magazine for marketing and media cited it as “A Significant Milestone in the use of Television Technics for Marketing Success. More than half a lifetime ago, I was only 32 years old at the time and in the first decade of what would be a four-decade career as a DMO exec. It didn’t sink in until years later how rare what we had achieved actually was. Friends at Seattle-based Alaska Airlines had won a CLIO award a year earlier and seeing our little campaign’s potential encouraged its submission. Of course, “I Love New York” as a state tourism campaign had won a CLIO three or four years earlier as did Michigan tourism a few years later. Two other community DMOs have reached the short list or received bronze or silver recognition in the years since. DMOs are nonprofit organizations with the in-house skillsets of commercial advertising, marketing and public relations agencies. But instead of being generalists about a lot of different products and services, DMOs are established to specialize, day in and day out, in the safeguarding and leveraging of the brand of a particular location. They are a means to draw and optimize visitor centric economic and cultural development for the communities they serve. Think of DMOs as an inch wide and a mile deep compared to agencies-for-hire which, by nature, must be a mile wide and an inch deep in order to be relevant to many different types of businesses. Another DMO I subsequently led before retiring went on to garner more than 100 other awards for marketing and best practices. Still, none quite reached the acclaim achieved by that little spot we produced for Anchorage, Alaska in 1981. Here is the story of how Wild About Anchorage came to be, To my wonder, still resonates there more than three decades later based on online comments. When I arrived in mid-1978 to complete a three-year-old DMO start up for Anchorage, two of the major obstacles we faced were internal. Yet research was showing that the amenities offered by Anchorage were important to potential visitors. At the same time, Anchorage residents were skeptical toward tourism because having divided the state into stereotypes traditional long-haul tourism interests had pegged Anchorage as the overnight between Mt. McKinley and Prince William Sound. Yet surveys and inventories had shown that Anchorage offered virtually every Alaskan experience in a shorter, less logistical and expensive trip without diverting travelers interested in some of those traditional itineraries. We needed a communications vehicle that would illuminate Anchorage’s personality and serve to give voice to community pride, while establishing a platform from which we could build awareness of the community’s role in tourism. During 1979, we tinkered with some print tourism ads headlined Anchorage & Anchorage juxtapositioning two side by side images, one featuring something iconic about Alaska such as wildlife and the other featuring an Anchorage amenity such as great dining. While we knew it was too “straight up” or serious for the PSAs we wanted to run locally which would also reach the majority of Alaskans, we felt we could build on that positioning. We were working with a small boutique agency at the time in Seattle which until we could develop organizational capacity was the only entity willing to produce our annual visitors guide including selling the advertising. One day while discussing the campaign we wanted to create, I mentioned a Chevron commercial that had been created by Kurtz And Friends as an example that might work. We knew straight up imagery wouldn't be as effective because Alaskans were over exposed to incredible photography. We also needed something that wouldn’t take the community too seriously. Tom Bardeen, one of the principles in the boutique, was familiar with Bob Kurtz, who had earned fame doing the titles for The Pink Panther and offered to see if he was interested in producing an animated spot for us on behalf Anchorage. 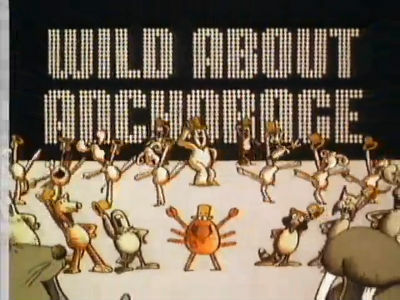 He was, and either Tom or Bob or maybe both fell on the idea of a chorus line of animals to convey the message that Anchorage & Anchorage had only in an animation format. The spot took off instantly with not only Anchorage residents but Alaskans as a whole. Still a decade before the worldwide web would be viable, I guess you could say it went viral. Within weeks we knew the moose in the center of the chorus line would work as the graphic symbol in our branding of Anchorage for external audiences as would the tagline Wild About Anchorage. Linda Chase, an event organizer, agreed to do costumes for an actual chorus line we could take on the road at promotions as well as use at local events and during welcome ceremonies for conventions. A contest in schools gave the moose a name – Seymour of Anchorage – get it? Tennys Owens, a local art gallery owner, arranged for sales of the original celluloids and residents lined up around the block to buy and frame them. I still have one the board gave me when I moved on. A statuette of Seymour was created to give to awardees at award dinners. Coming up with a magical campaign such as this is always a bit serendipitous by nature. Testing can measure a lot of things including potential popularity, but usually not deep and enduring engagement over more than three decades. Nor do DMO marketers or should I say DMO governing boards have the patience to let a campaign play out like Anchorage obviously did. About the time it seems everyone on the planet must be heard of it is when a campaign is just starting to penetrate. Little did we know then that by the end of that decade traditional advertising overall would begin a three decade decline in effectiveness. In today’s marketing environment where ads now have a negative return on investment and channel fragmentation makes a PSA campaign impractical, it wouldn’t be possible to do what we achieved in 1981. I am humbled that people still embrace Wild About Anchorage as a legacy campaign. We were very lucky and I was blessed to play a part as the producer. Hats off to Tom Bardeen who wrote the lyrics and Dale Case (101 Dalmatians and Fatherhood) and Pam Cooke (Family Guy and Simpsons) who did the animation and especially Bob Kurtz who designed and directed Wild About Anchorage.